Very little has changed since last month’s market report. Coming next week – Is NOW a good time to buy or sell a home in the Charlottesville area? Make no mistake – properties are absolutely selling right now. However, those who are willing and able to sell are frequently those who have owned their homes for more than four or five years. Also – see the “Market Retort” from August. For the purposes of this post, the charts and graphs show Albemarle, Charlottesville, Fluvanna, Greene and Nelson Counties. – Nearly 15 months of inventory. 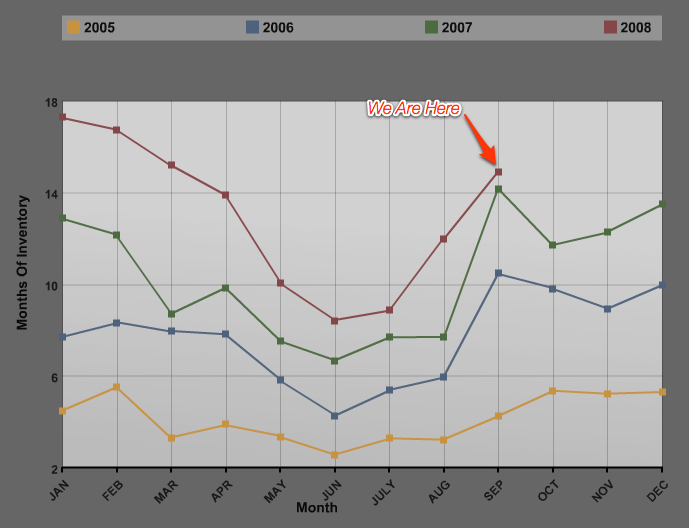 – Days On Market actually seem to be down**, September ’07 to September ’08, sales volume appears to be about the same. 122 of these have days on market *** of less than 30 days, 161 have DOM of less than 60 days and have 217 DOM of less than 120 days. 38 have DOM of more than one year, 5 have DOM of more than 600 days. In short, about 35% of sellers whose homes are under contract were willing and able to price their homes to the market. My advice at the bottom. Question for readers – What do you want to know? Selfishly, I’d like to see a dramatic reduction in the Realtor ranks – it would help professionalism, competence and public perception. In reality, the low annual fees in order to maintain membership likely will keep the losses from being more than ten percent. ** See this post for an example of why the data cannot necessarily be trusted, but that it does provide a fairly accurate guide. I think we may be about 25% of the way into these unknown, murky waters. If you don’t have to sell, don’t. If you have to sell, price aggressively. If you’re buying (and it’s really a great time to buy for some) – be smart. If you’re seeking to hire a Realtor, ask him or her about their production levels and experience. Interview them as if you were hiring them to represent your best interests on what realistically may be the single largest financial decision of your life.